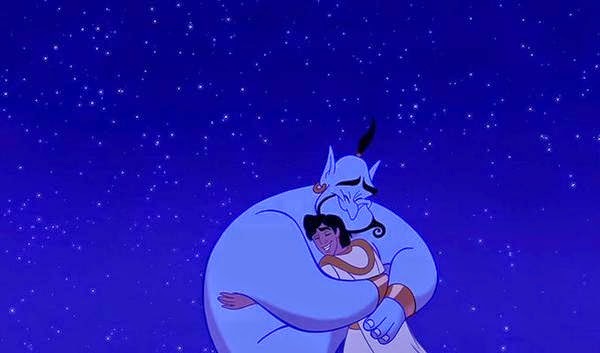 Bighearted, funny and vivacious, Genie is the character that most fits the way the world saw Robin Williams. Growing up watching him on hyper-used VHS tapes, I’ll always remember him as the loveable, portly Mrs. Doubtfire, the guy from Jumanji, the zany scientist in Flubber, and the list goes on; he was the caring uncle figure who caused so many of us kids to belly-laugh over the years. I won’t try and pretend I know the ins-and-outs of Williams’ life, but I do know that he suffered painfully with Depression. I capitalise the D, because without it – I feel – the word is trivialised. There is a huge difference between Depression and feeling depressed, as has been explained in many of the amazing articles published since the crushingly sad news of his passing. I, myself, have at times felt the latter. Like a black cloud settling upon my shoulders, blurring my vision of reality with a viscous, vicious darkness. Yet, the cloud has always shifted and lifted and I’ve been able to carry on. That’s the difference. A staggering percentage of the population live permanently behind the bars of an illness that maliciously encapsulates the mind and greedily digs away at the self. I can’t fathom their suffering. Moreover, I can’t even begin to contemplate the torturous sadness one must feel to figure that the only solution is to die. Fully extinguishing the already dimmed light of life. Calling suicide a selfish act is innately ignorant – it envisions the mind of someone with Depression as a healthy, logical one, which of course it is not. It is injured. How people can refer to suicide as ‘the easy way out’ and the deceased as cowardly I will never understand – comments like this are bred from misunderstanding. Mental illness is an affliction that affects so many of us. Nobody I know has resounding 100% mental health. Why then is it so terminally ignored and misrepresented? As someone who has been plagued with anxiety, sometimes to a debilitating degree, I understand how much our state of mind can alter our entire lives and wither our vitality. It’s hard to feel motivated to do anything when every waking moment is a struggle. Lack of communication makes things so much worse. In a world where we tell boys from a young age that to show any emotion is to be weak, and girls that it’s not what’s within their heads that’s important but what their bodies look like, society teaches the individual to be silent. The painful truth is that silence is violence to the self. We need to rid ourselves of the hurtful stereotypes and ignorance that surround the way we as a culture treat our wounded; we need to nurture and help those who suffer with mental illness so that they can heal within the warm cocoon of understanding; we must not cast them even further into the darkness. Nobody should ever feel that alone. We would not banish our loved ones suffering with cancer or other physical illnesses. Why then do we trivialise Depression, telling sufferers to “get over it,” and to “pull yourself together”? By thwarting and ostracising our mentally wounded, we drive them into the numbing grip of alcohol and drugs, or the vengeful hands of firearms, or to the extreme escape of death. If Robin Williams, our beloved uncle who inflated our youths with laughter, can teach us anything it is that mortality rules us all, and even a Genie can be overwhelmed with sadness. More than that though, his death teaches us that we must not be silent. This is not a black-and-white issue. I do not wish to imply a simple solution, or that all those with mental illness need is someone to talk to. Communication and understanding will not fully quell Depression. But, for those that live miserably in silence, a more open world where girls and – importantly – boys can vividly express how they feel to empathetic, sympathetic peers and explore treatment without taboo or disdain can ONLY be beneficial. Maybe then those who have left us will not be tarnished with words like ‘selfish,’ ‘coward’ or other hateful insinuations despite their brave attempts to fight their demons. Maybe then we can bring our children, uncles and others back to life. Maybe then we can all be free.